"It's hell getting older...especially when you feel 21 inside. All the strengths that sustained you all through your life just vanish, one by one. And you study your face in the mirror and notice something's missing...and then you realize - it's your future." I took forever to getting round to writing this review because I don't know how to not like a Woody Allen film. 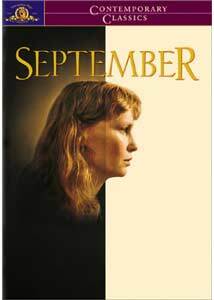 September is not a bad film; it's just perfectly unremarkable, never capturing my attention, my interest or my emotions. Even at his most intimate, Woody always has something universal to say, but this little angst-tinged story is just, well, a bore. Mia Farrow is Lane, a delicate, wispy creature who has recently survived a suicide attempt. It is late summer in Vermont, and Lane's quiet country home is filled with visitors: her neighbor Howard (Elliot), who is silently smitten with her; an unhappily married friend, Stephanie (Wiest); Peter (Waterston, as Allen's token writer), who has rented Lane's guesthouse for the season; her mother Diane (Stritch), a gregarious, faded actress, and Diane's doting husband, Lloyd (Warden). Over the next few days, we discover Howard's aforementioned affection for Lane, Lane's for Peter, Peter's for Stephanie and Lane's unforgiving disaffection for her mother. Oh yeah, and the "dark secret" Diane has forced Lane to bear since childhood. I almost forgot. September is pretty much Allen's attempt to re-create the atmosphere of, let's say, Cries and Whispers, in the vein of his more finely crafted Interiors. Lane's sun-filled, white-washed house suddenly becomes claustrophobic, steeped in the gloom of the ensemble's interactions and eventually, total darkness (literally, when a storm disrupts the power) - why is it that, when robbed of the distractions electricity provides modern humans, their discomfort and ensuing boredom inevitably illuminates their darker thoughts? Ah, right...this only happens in the movies; in my house, we make shadow-puppets with a flashlight. By dawn's early light, all is revealed and it is obvious that people are meant to live lives unfulfilled and that which one desires remains eternally just beyond one's grasp...but, "After all, September is another month." Image Transfer Review: This disc continues to represent the fine transfers MGM has allotted their second Woody Allen Collection. As clean and near to life as film gets on this medium, with colors superb from the soft pastels of interior daylight to the richer tones provided by incandescent evenings. Bravo, MGM. Audio Transfer Review: The first few minutes of the film will drive you to reach for your remote and cause hair-tearing frustration as you attempt to remedy what appears to be a default to the French language track - don't waste your time (like I did). The English, French and Spanish tracks provided are all suitable for the subtle, even dialogue. Woody's usually impeccable choices for ambient music come through well without ever overpowering the dialogue. Extras Review: Subtitles in French and Spanish are easy to read white with black outlines and overlay the image, for the anamorphic crowd. Again, I ask MGM to include English subtitles: I might just resort to begging soon. The original trailer is in 1.85:1 and is as clean as the feature. A rule of sixteen chapter-stops seems to be have been made for this collection, not quite adequate. A single-fold booklet with production notes is included. I wouldn't want to talk about this one either, Woody. The first disc I reviewed in MGM's Woody Allen Collection 2 was the passed-over gem, Shadows and Fog. Also widely ignored, September actually earns its place as a weed in Woody's glorious garden. I've had better months.